When it comes to over the top action, Rocket Salvage has you covered. 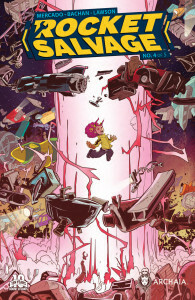 In this issue, the top rope action is highlighted by Primo’s daring prison break and subsequent escape in the shell of a rocket. I mean, c’mon, he’s escaping in a nuclear missile for Pete’s sake! (OK, I have no idea who Pete is or how that even became a saying. It is a saying right? It’s not just some hyper localized colloquialism that popped up in semi-rural East Central Illinois that I and maybe six other people remember hearing in our youth right? Or is it just something my Dad would say? Note to self: Google “For Pete’s Sake”.) Add to that, the coolness of Zeta learning to master her Mechakenisis and blowing stuff up along the way. One of the things Lucha Libre does well is work comedy into the action without upsetting the flow of that action. Kind of like Rocket Salvage does. And thanks to Zeta when she asks Utzman if he was in prison for being a moron, I laughed out loud. (Nope. Not going to type the short hand version of Laugh Out Loud. Not going to do it. It’s one of those things I just don’t do. And won’t do. A guy has to have his standards.) Clearly Utzman is the comedic punching bag here, but he’s also a fairly important lynch pin to this story. So again, nicely done Rocket Salvage. But in spite of all the over-the-topness, (pretty sure that’s a word now. But even if it’s not, it is at least accurate.) Lucha Libre can be some of the most heart-felt storytelling of its kind… Just like Rocket Salvage. It’s blatantly clear that Primo cares deeply for his family, no matter how dysfunctional they may appear. Besides, how awesome does flashback Primo look in that opening panel with his near mullet hair and classic handlebar mustache? Plus, little Beta and his eye patch. That’s family right there. So all in all, when I say Rocket Salvage is like Lucha Libre, it’s nothing but a compliment. No matter what your flavor of Lucha may be AAA, CMLL, or Lucha Underground (by the way, if you’re not watching Lucha Underground, you totally should be. If you like the pro wrestling that is. It’s really solid. Good matches. Nice action. And Vampiro is a really rock solid color announcer.) or just dig that kind of action; you should give Rocket Salvage a few minutes in the ring.